The Orchid Thief meets Botany of Desire meets Driving Einstein's Brain in Richard Horan's Seeds, the chronicle of one man's quest to understand the influence and impact of trees in American life and literature—and his mission to collect seeds from the homes of Kerouac, Welty, Wharton, Kesey and twenty other authors, to preserve the literary legacy of American forests for generations to come. Richard Horan is a novelist, English teacher, and book reviewer for several national publications. His novel Goose Music was a finalist for the Great Lakes Fiction Award and won the ForeWord Book of the Year Bronze Medal. 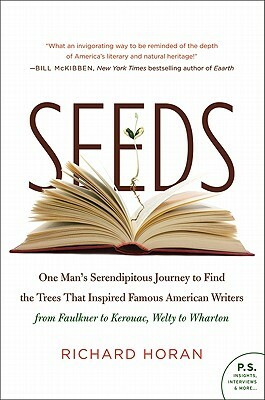 He is also the author of Seeds: One Man's Serendipitous Journey to Find the Trees That Inspired Famous American Writers from Faulkner to Kerouac, Welty to Wharton. He lives in Oswego, New York.